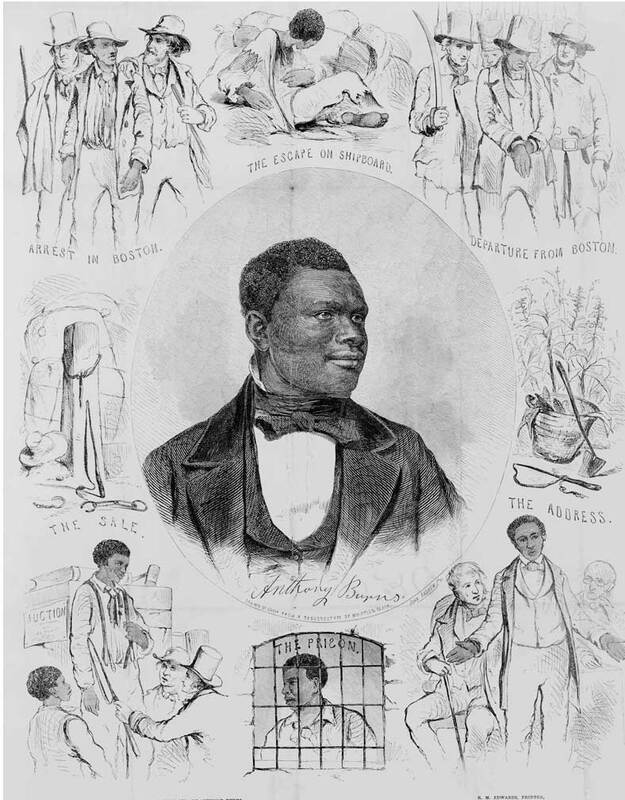 On March 1854, Anthony Burns, a Virginian slave, escaped and fled to Boston. He was apprehended. Bostonians rallied to his defense and tried to block his return to Virginia. President Pierce called in Federal troops to insure Burns' return to Virginia. Thus, Federal soldiers escorted a captured slave through the streets, while Bostonians stood by, with American flags flying upside down. Anthony Burns escaped Virginia where he was a slave and traveled to Boston by boat in 1853. Burns held a job in Boston. He was found on May 24th, 1854, as he walked a Boston street. Burns was imprisoned, awaiting trial, and his return to Virginia. While he was in prison, local abolitionists besieged the jail in a bid for his freedom. A deputy Federal Marshall was stabbed in the ensuing melee. However, Burns remained in custody. The trial against Burns was a mere formality. When the government won, President Pierce made sure that the streets of Boston were lined with Federal troops to ensure Burns was taken aboard ship for his return to Virginia. The forcible removal of Burns to Virginia enflamed public opinion in Boston. Many people who had been ambivalent about slavery became critics of it as a result. After his return to Virginia, Burns was sold to a different slave owner. Burns' new owner agreed to emancipate him, after receiving $1,300 from Abolitionists. Burns returned to Boston. He went on to get a degree from Oberlin College. Burns died from Tuberculosis at the age of 28.